With equities breaking a new cycle low of sp'1926 in early morning, the VIX broke a new high of 17.98, but cooled, settling -3.3% @ 16.16. 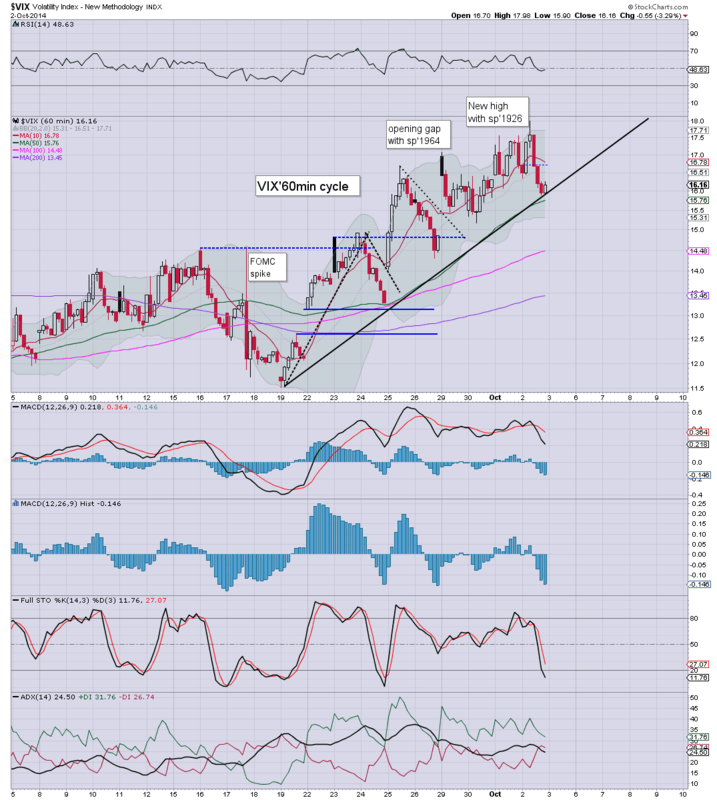 Near term outlook is for continued equity weakness, and that will likely see the VIX in the 18/19s. So, a moderate daily decline, but still...the broader trend in volatility remains to the upside. With sp'1904 now seemingly likely next week, that will probably equate to VIX continuing to increase. In any case though, even if VIX breaks the big 20 threshold... it won't stay above there for long. I would consider being long VIX.. but not in the current multi-week down cycle. Right now, I might go long VIX late Oct/early Nov'. US equities broke a new cycle low of sp'1926, with a typical latter day rally to 1952, settling u/c @ 1946. The two leaders - Trans/R2K, settled 0.8% and 1.0% respectively. Near term outlook is for another wave of downside, with a full test of the August low of sp'1904. 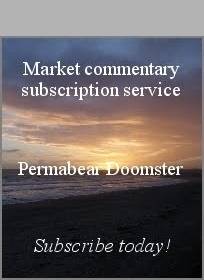 *I went short the market from sp'1948 in the 2pm hour, am holding overnight. So... we broke another new low today, and this was somewhat confirmed by a higher high in the VIX. With the R2K failing to hold the critical 1080s, the bears have achieved another set of victories today. 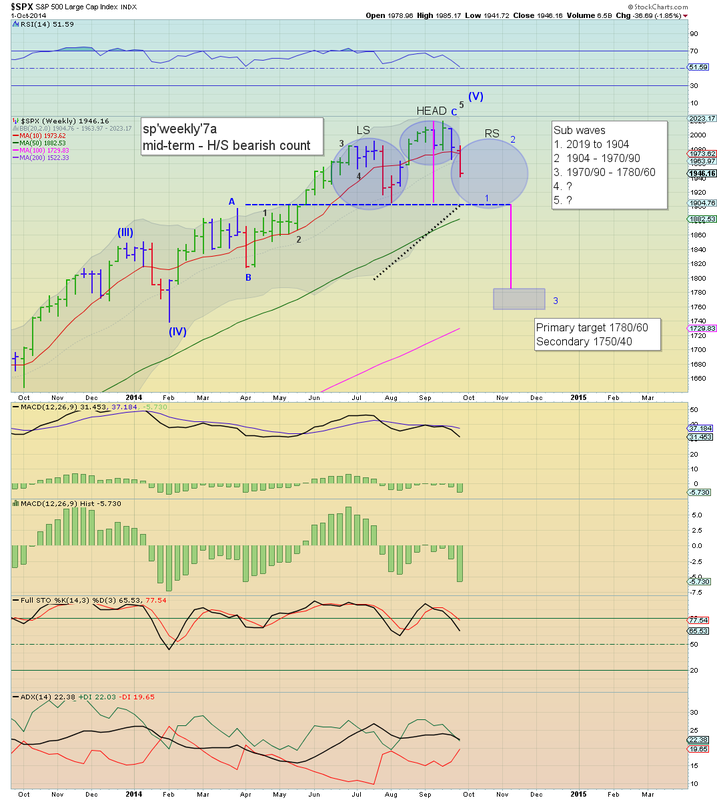 Outlook is bearish.. and I see no reason why we won't hit the lower weekly bollinger, which right now is around sp'1904. US indexes have seen a very notable wave from sp'1926 to 1950, but with the broader trend breaks - not least with the R2K failing to hold 1080, the bears remain in control. VIX has cooled lower, but with likely moderate upside into the close. 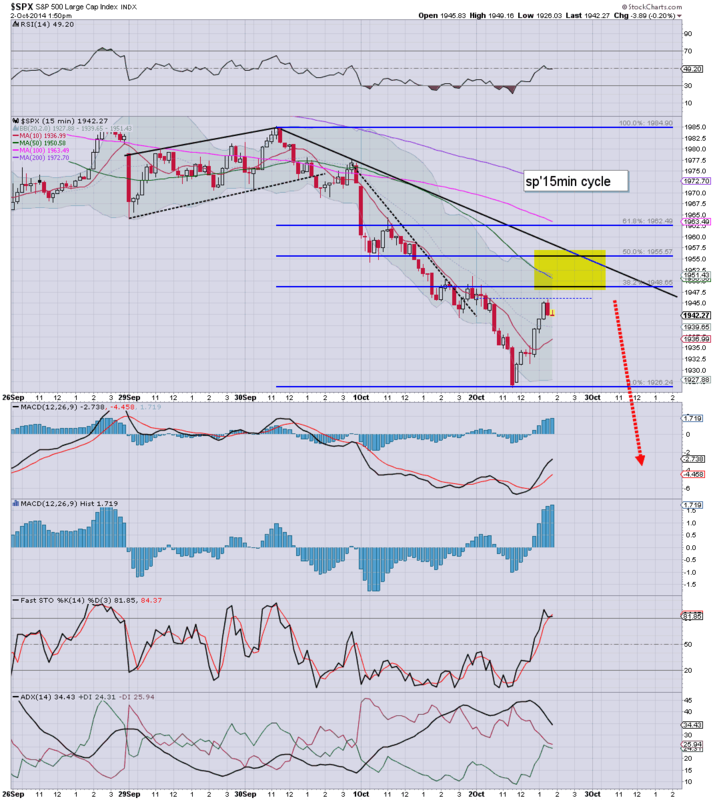 *I am short from sp'1948... with hold overnight.. .seeking an exit in the 1920/15 zone. Today feels very much like last Friday.. with a bounce into the afternoon. Last Friday I shorted the market.. and after some hours of waiting... I'm back on the short side. Considering the MANY trend breaks, there seems no reason not to be treating the bounces as......... bounces. *I'd like to some renewed upside kick in the VIX.. a daily close in the 17s would be useful. 3.25pm... minor chop... and the setup is very much like last Friday. 3.36pm.. indexes turning red a little.... overall... looks okay. 3.48pm.. Rats are getting twitchy... some selling into the close seems underway. *I hold short overnight...seeking the 1930/25 zone at the Friday open... 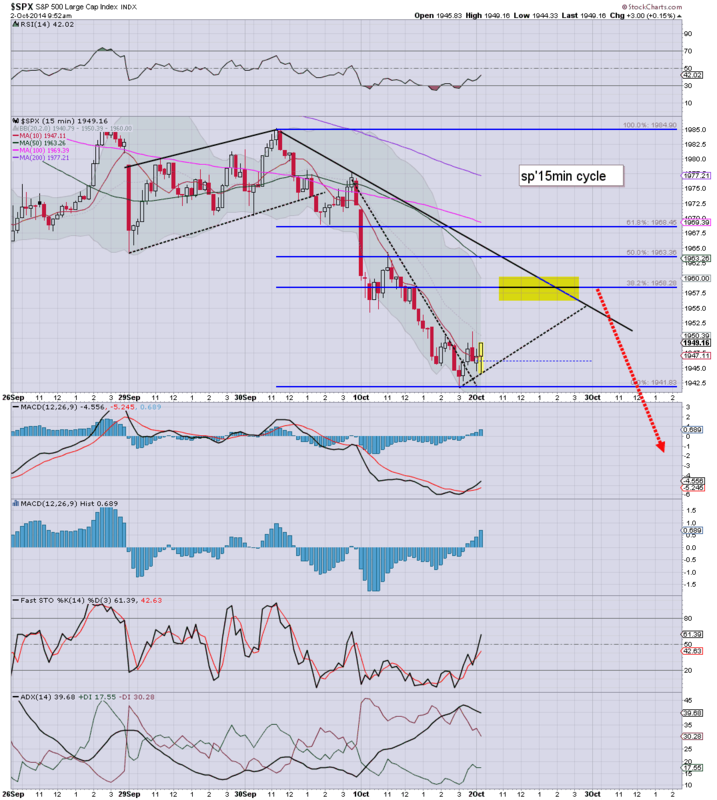 I realise that is somewhat bold.. but still.. the broader weekly trends are now bearish. 2pm update - bounce complete? US equities have seen a bounce from sp'1926 to 1945. 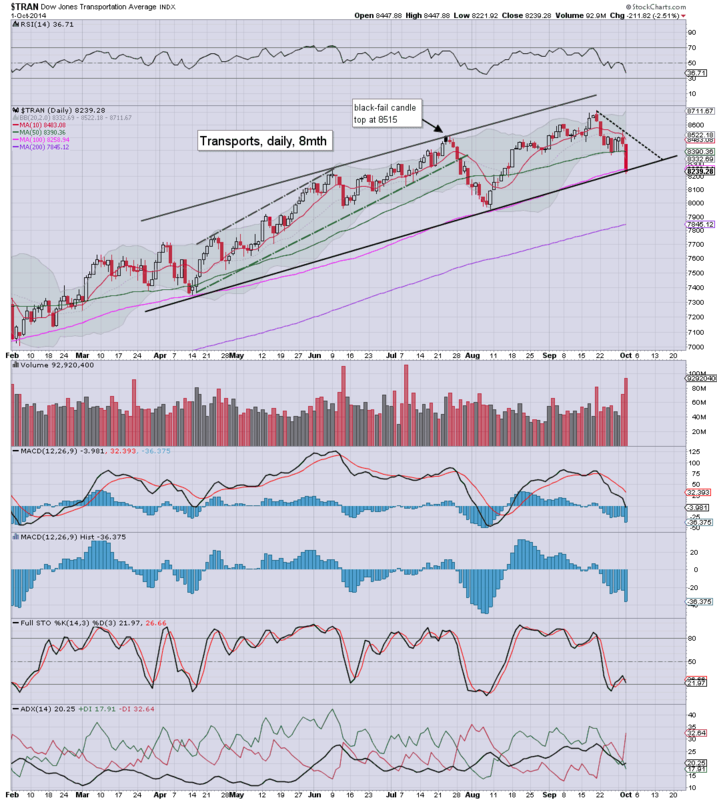 The broader trend remains very weak, and a move back above 1970 now looks unlikely for some weeks. VIX is a little lower, reflecting a market that is still not yet particularly worried. *I'm considering launching an index-short this hour, but certainly...no longs for me unless 1910/00 zone. Lets see if we can churn out a mini-top around 2.30pm. We have the jobs data tomorrow of course, but really, I just can't see that sending the market on some kind of major moon-shot. Why would sp'1926 be a key low? If no... then its a simple re-short this afternoon. 2.15pm standing by for an index-short.... sp'1948..
2.19pm.. SHORT from sp'1947...... now its back to the waiting game. 2.30pm... It is typical turn time..... strong resistance in the 1950/55. 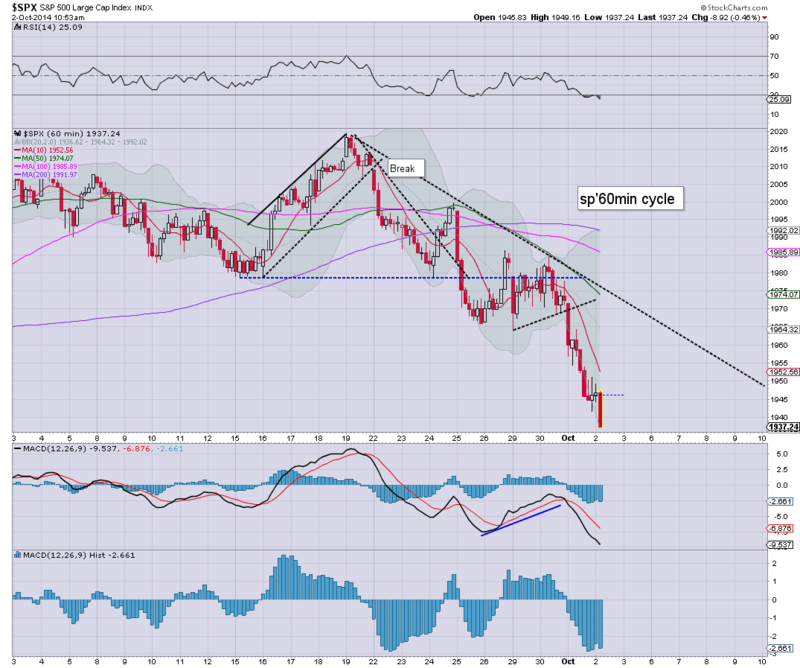 US indexes remain very weak, but as ever.. there is threat of a smaller bounce. VIX is holding moderate gains of 2% in the low 17s. With the R2K having broken the critical 1080 floor... the bigger picture is now clearly swinging fully toward the equity bears. With the jobs data tomorrow, there is threat of a 'dumb bounce' to the 1950s.... but that is a good 1% below the now concrete resistance wall of 1980. *I might look to pick up a short...late tomorrow.. as i did last Friday afternoon. Primary target is now the August low of sp'1904...before a 2-3 week bounce. The 1000 threshold looks set to be hit this Autumn.... 900s would make for sp'1750/1650. 1.25pm.. Typical turn time is of course 2.30pm... 1948/50 zone would be an interesting area to short from.... 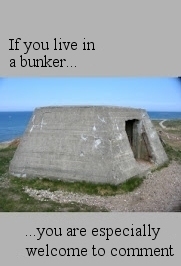 I'll certainly consider it. US equities continue to slide, and we're getting somewhat close to the August lows. 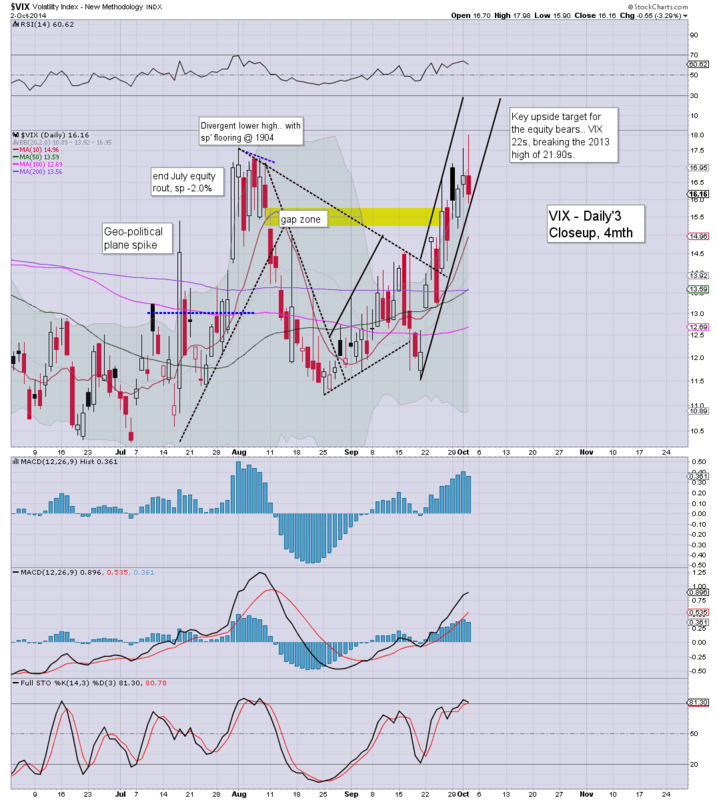 VIX is showing some moderate upside kick, +6% in the 17.70s. 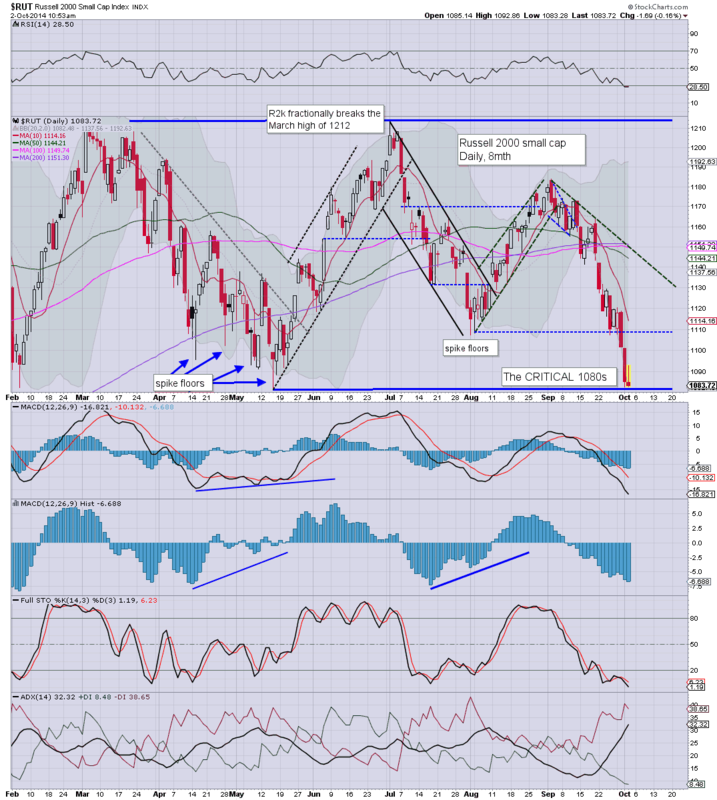 R2K has lost the critical 1080 floor, and looks headed for 1050 in the near term. Frankly, this is starting to get rather entertaining. As ever, my sights are on the bigger price structure, and for you regular readers out there.... chart sp'weekly7a remains the 'stuff of dreams'. *I am more than content to sit on the sidelines... will look to go long from 1910/00... hold until 1970/90.. .and then launch a 'mini crash re-short'. 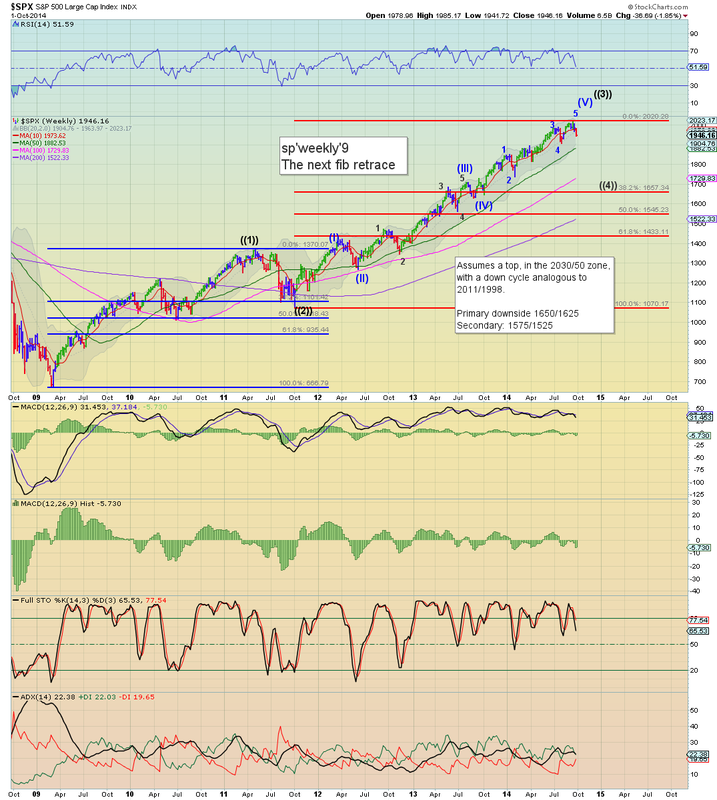 US equities fail to hold, and break into the sp'1930s. VIX has turned a touch higher, +2% in the low 17s. Price action remains very weak, with a much broader downside target zone of 1920/00. R2K is in imminent danger of losing the critical 1080s. As ever...sometimes bounces just fail right from the outset, and that is the case this morning. 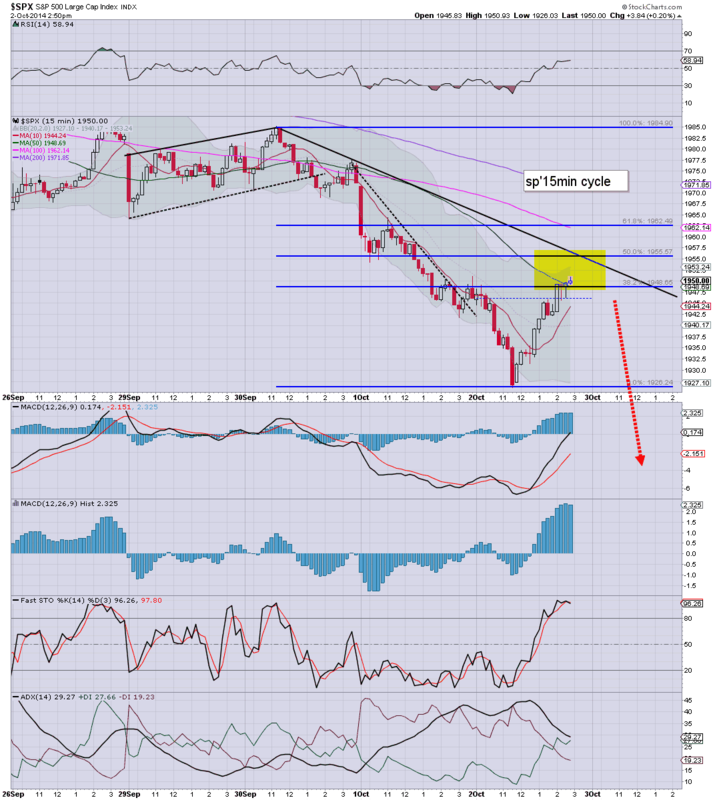 R2K looks set to lose the 1080 floor... opening up 1050.. which would likely equate to Dow 16300, with sp'1900. *for me, at least I'm not long, and I have ZERO intention of going long until the 1920/00 zone. I'd have no concern going long around 1905/00... but right now that is very unlikely until the latter part of next week. 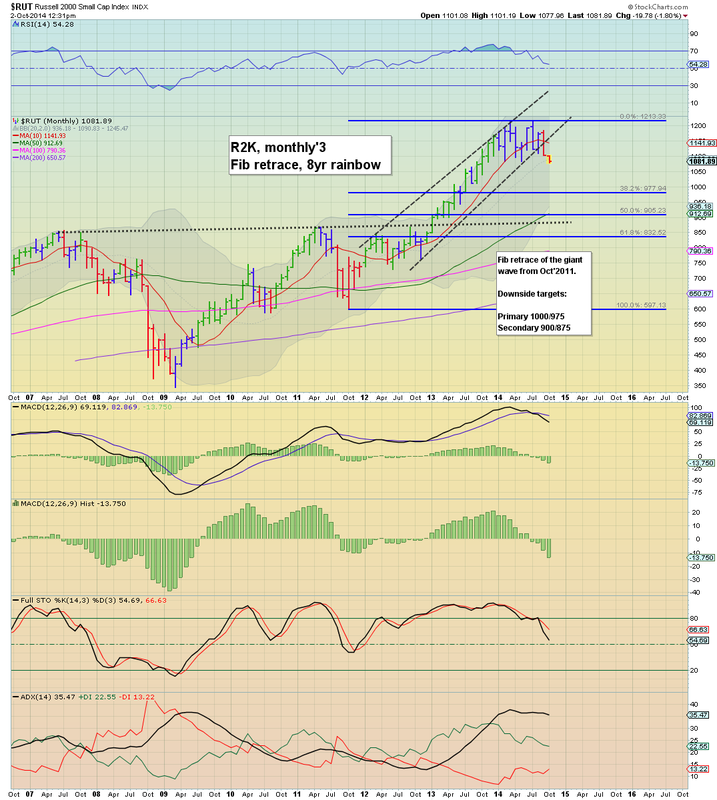 11.10am.. R2K still holding the 1080 floor, but really, it looks completely busted on the bigger monthly cycle. 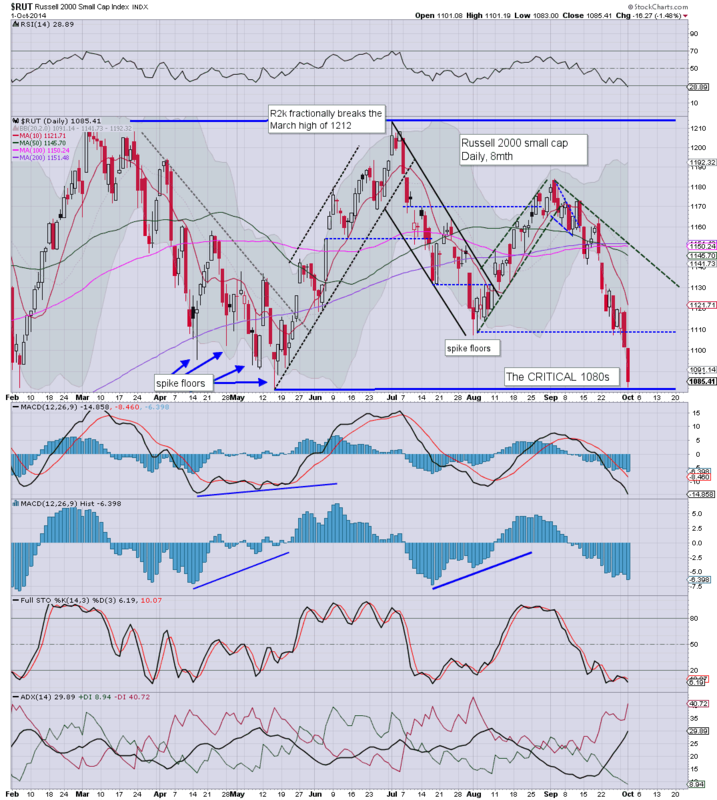 Sp'1934...we're only 1.5% from the August low, and that is now within range by tomorrow. Overall... for those looking for real downside action in the autumn... this is a promising initial wave down so far. 11.42am... Major day for the bears, we look headed for a full test of the August sp'1904 low. Equity bulls have a problem with an increasingly strong wall around 1980. *I'll consider picking up an index short later this morning.. certainly if we get stuck around 1960. 10.01am. Factory orders : -10.1%... truly lousy number. 10.09am... weak chop... but it does seem we'll get that minor bounce. Good morning. Futures are moderately higher, sp +5pts, we're set to open at 1951. Metals are weak, Gold -$3, with Silver -0.7%. Oil is lower by a significant -1.6%. 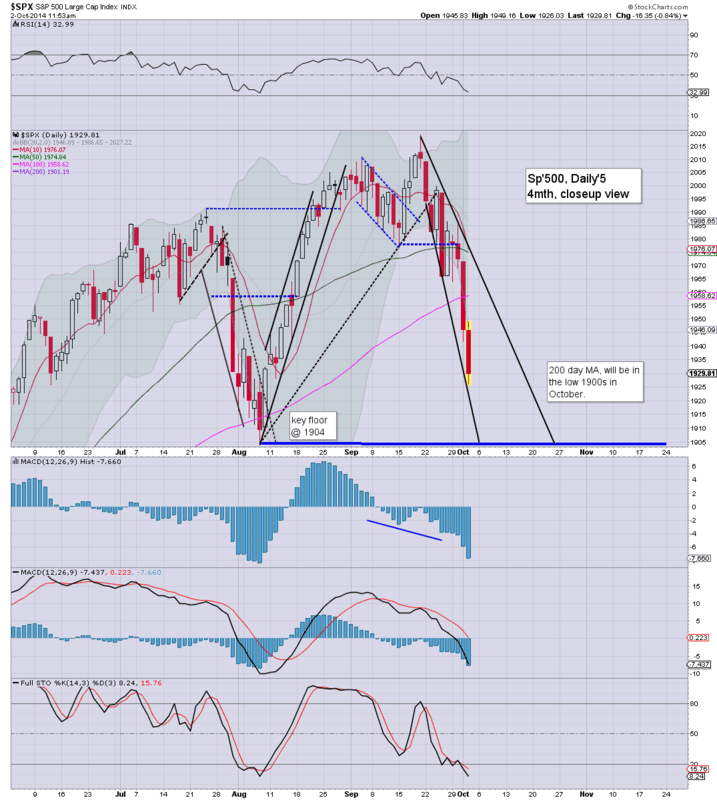 Equity bears are back in control, and should be able to push generally lower into next week. So..we're set to open a little higher, but I'd assume the market will turn red at some point today. For me, the VIX remains a key issue... bears really need to see 18/19s to give more credence to the current down wave from sp'2019. 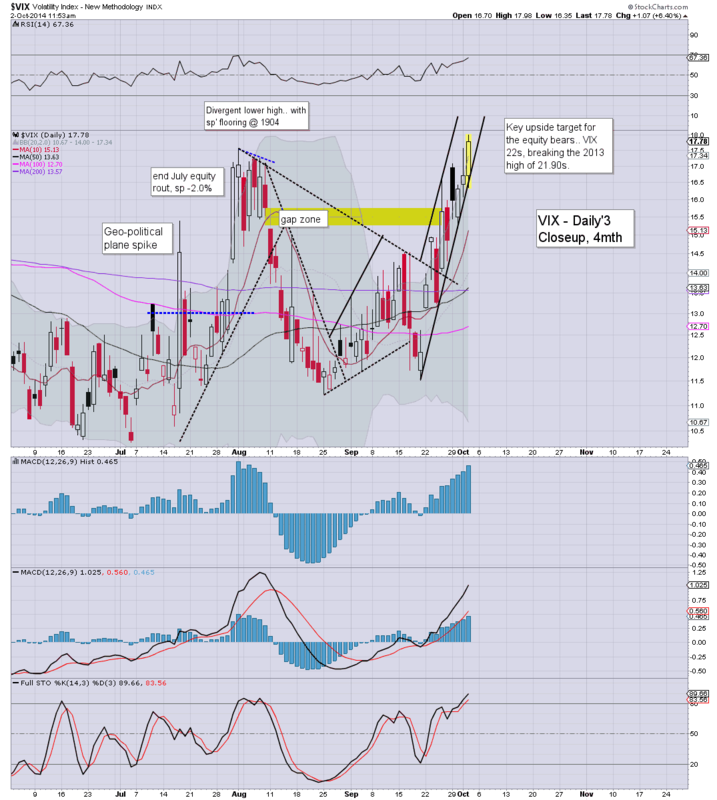 Oscar is indeed correct to highlight the VIX.. and the issue that it gets stuck around the 200 MA. Bears really need a weekly close >17.50. Notable early strength: TSLA +5.6%, I've no idea why, but then.. its a momo stock. 8.53am.. Draghi is talking..... indexes starting to slip..... sp +2pt.... 1948. 9.06am.. Indexs turning red... sp -1pt.... Mr Draghi is not inspiring anyone right now. 9.21am.. sp -3pts... 1943..... the ECB chatter is not pleasing anyone. I've a target re-short zone of 1958/60... possibly by 11am. With US equities seeing renewed downside - after having notably failed across Mon/Tuesday, the door has re-opened a rather interesting scenario for the autumn/early winter. If the bears can hit the 1920/00 zone before end of next week... things get real interesting. 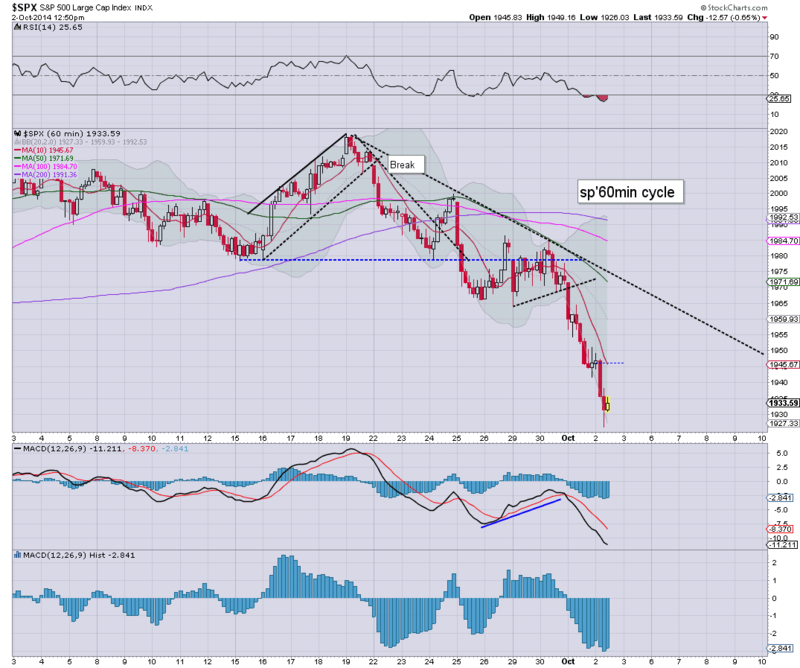 Suffice to say, despite not being short today, I was delighted to see some renewed downside. With the break to the low 1940s, the more bearish scenarios are back on the list of possible outcomes across the remainder of the year. Bears MUST attain at least a hit of the sp'1920/00 zone. It is not necessarily to hit exactly the August low of 1904. Even if the bears manage to push lower to 1920/00, they will still need to contain what will likely be a VERY strong multi-week bounce across mid/late October. At minimum, the bull maniacs would probably be able to muster the 1970s.. possibly even the 1990s. On any basis, if there is ANY break >2000 on the bounce, then the H/S scenario would get dropped. 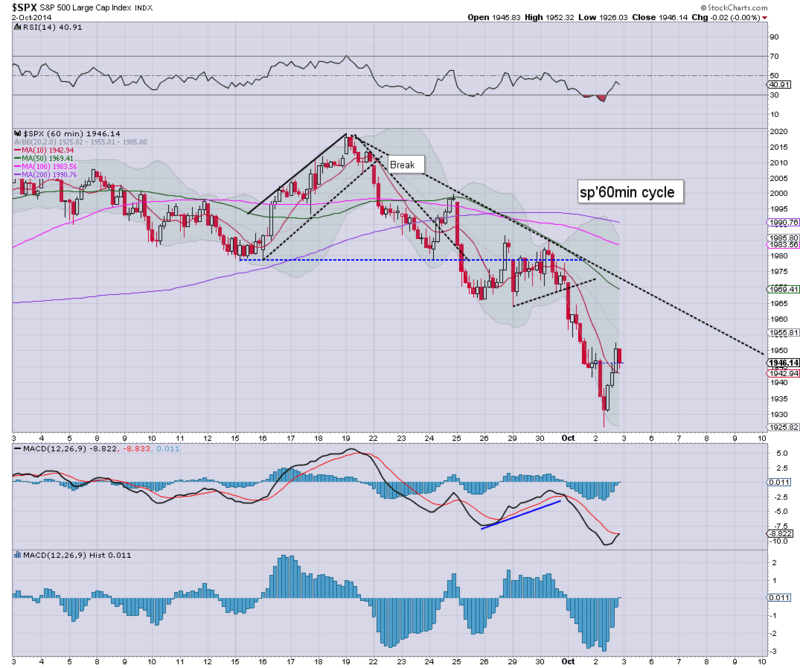 The inter'2 (or whatever you want to call the summer 2011 wave) was a strong 38% retrace. Right now, that would equate to roughly a down wave from 1970 to 1650 or so.... a clear 300pt drop... roughly 15% for the broader market. I'll be the first to admit, that for the moment, such a scenario is in the land of 'crazy talk'. For now, such a scenario is indeed the stuff of bear dreams... but its good to dream, right? So, lets see if we can first hit 1920/00, and then see if the bounce can be contained, with the market getting stuck somewhat around 1970/90, no later than mid November. We have the usual jobless claims, factory orders, and the Nat' gas report. There are also 2 fed officials on the loose, and as ever, Mr Market will be listening. *there is QE of around $1bn.. which is 10% of this months total. US equity indexes all closed significantly lower, sp -26pts @ 1946 (intra low 1941). The two leaders - Trans/R2K, settled -2.5% and -1.5% respectively. 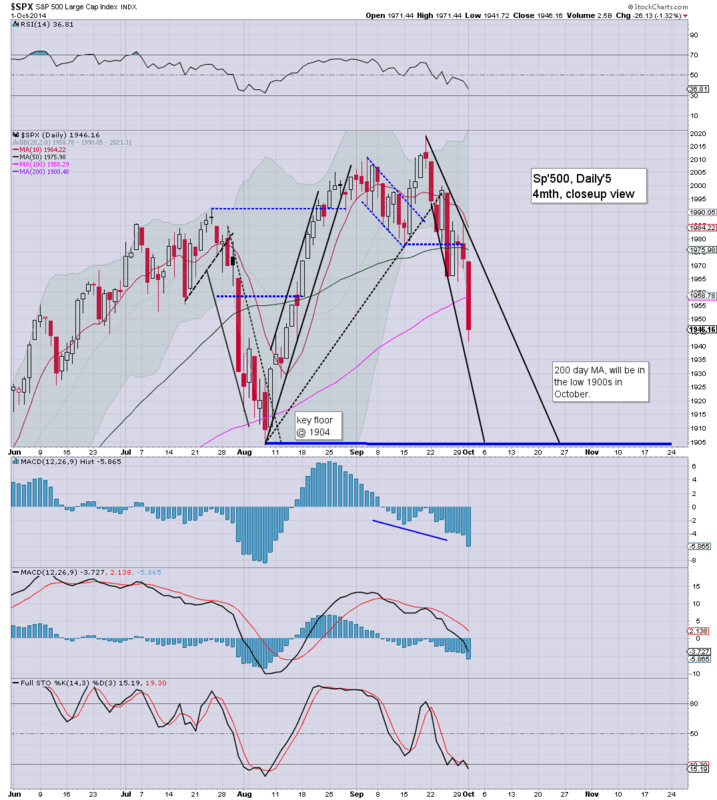 With the renewed weakness, equities look vulnerable to the sp'1920/00 zone next week. The declines in the two market leaders - Trans/R2K, were indeed significant, and they do bode for lower levels in the near term. The R2K just managed to hold the critical 1080s today, but considering the trend... R2K looks effectively completely broken.. as especially seen on the bigger monthly cycle. Perhaps most important, the sp'1980/75 zone is now starting to become a strong resistance zone. Until we break above there, bulls have a real problem.